Odyssey Coach Lines is a motor coach company based out of Saskatoon, Saskatchewan. We have grown from a tour only company to the present company consisting of motor coaches and tours. We pride ourselves on our excellent customer service and the ability to accommodate all group sizes, budgets and requirements for single or multi-day charters. Odyssey provides chartering services to many well-known companies throughout Saskatchewan including the Saskatoon Medical Association, U of S, Saskatoon Track and Field Club, Cargill, and more. Many sports teams, church groups, and schools also rely on Odyssey Coach Lines to get to and from their events safely and worry-free. Click here to request a quote. 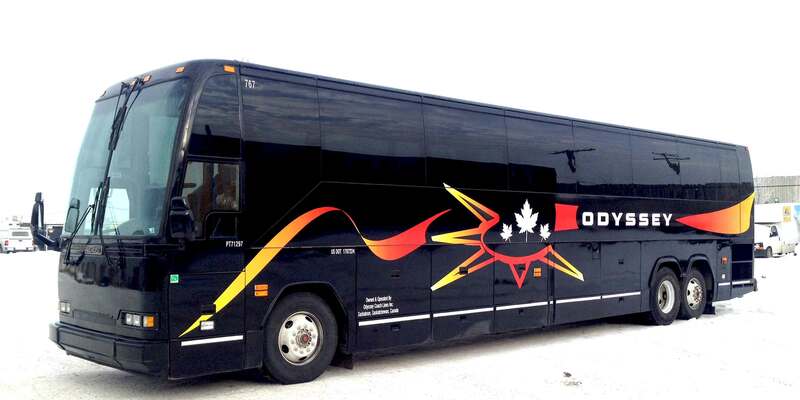 Odyssey Coach Lines also provides single and multi-day tours to many different locations throughout North America. We are licensed and insured all across Canada and the United States. Click here to view our upcoming tours.